Root Pouch fabric planting containers are made out of recycled water bottles + natural fibers preventing plastic from going to landfills and oceans. Root Pouch Grey Line is the most versatile semi-degradable Root Pouch available.Root Pouch is the only fabric container company that offers natural fiber blended fabrics. In-ground: natural fibers draw water from surrounding soil pot-in-pot prevents roots from penetrating fabric because it prunes by entrapment rather than air pruning. When used above ground roots are still pruned. Made from 100% recycled materials, PET & Natural fiber blend Available in sizes #1 to #600 with or without handles. Grey Fabric is available in approximate sizes from 1 gallon to 600 gallon, with and without handles. Click below for a printable version of the Root Pouch products Spec Sheet. Can I plant my plant in the ground with a ROOT POUCH on it? They say a picture is worth a thousand words, this picture was a tree that was planted 3 years ago with the bag left on. (Pictured is the Grey, 250 g/m2 bag) As you can see the roots are fantastic, they are strong, fibrous and very dense. Depending on the fabric used and how long the plant has been in the pouch, the answer varies, the tree photographed has been grown in a Root Pouch now for three seasons and the roots are fibrous and dense. With the exception of our boxer line, the fabric is made of a blend of natural fibers as well as PET. Root Pouch has perfected the process of mixing natural fibers into the fabric. No other company has this ability. The natural fibers are biodegradable and will start the degrading process quickly once dirt is on both sides of the fabric (buried with the tree) the bag when in the ground almost acts as a healthy membrane protecting and nourishing the roots. The PET does not break down, and thus our boxer line will not break down at all..
We created the natural fiber bags for the sole purpose of having a product that could be planted with the plants in the field, and then allowing growers to dig up. The reason we state on our website to remove the bag is because we distribute our product to every state and most all countries across the globe. Some countries as well as some states have restrictions on commercial horticulturist such as landscapers from planting any containers in the ground, to stay. Our direct customer base is not the end user, or consumer, it is the commercial growers and landscapers so all our advertising is directed on a commercial platform. That is why we advertise (website) that we recommend to remove the bag. Again take a look at the picture and I’m sure you will agree, that is a beautiful root structure. That is what you can expect of your trees roots with a little care in 2-3 years after you plant it. Why is Root Pouch the best choice for in-ground growing and pot-in-pot? Root Pouch fabric does not air prune like other fabric pots, rather it prunes by entrapment. Air pruning fabrics allow the root to squeeze through the fabric. 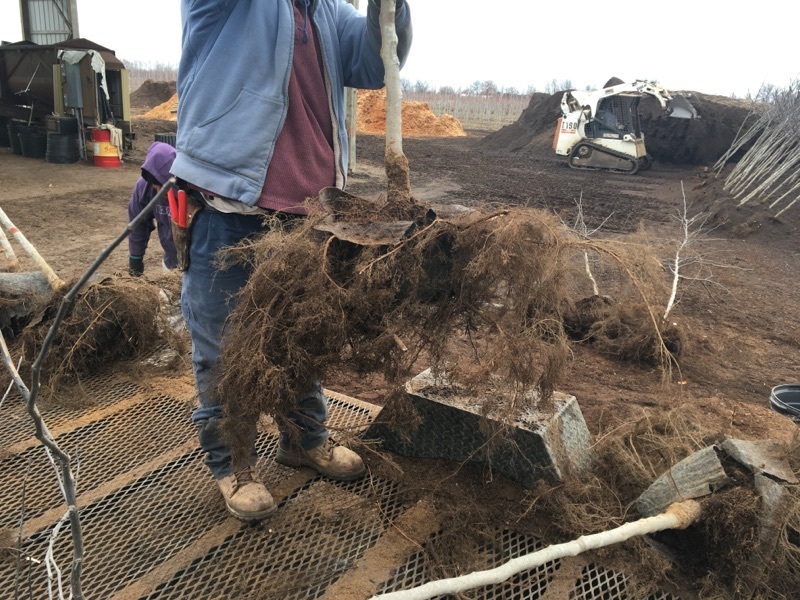 Root Pouch traps the root tips creating dense fibrous root systems while containing the roots within the bag, making it the best choice for in- ground and pot-in-pot applications. When used as an in-ground grow bag another advantage Root Pouch offers over all other bags is the natural fibers in the fabric draw water towards the pot from surrounding soil lessening the need for drip systems. Why are natural fibers beneficial in Grow Rooms? For grow rooms, the natural fiber blend offers thermal consistency. The natural fibers also retain an even distribution of water throughout the fabric wall lessoning water usage. What makes Root Pouch the best choice for healthier plants? Root Pouch fabric does not simply hold dirt it provides a healthier root environment. The fabric has superior insulation protecting the roots from heat and cold. The fabric weave traps the root tips preventing circling and girdling of the roots, encouraging the plant to produce a dense lateral root structure. The fabric disperses the suns rays preventing root tip damage from direct sunlight. What makes Root Pouch plant pots a more sustainable choice? Root Pouch is made from recycled plastic water bottles. These water bottles were destined to end up in landfills. This not only prevents the water bottles from ending up in oceans and the environment but also eliminates the need to make additional pots or bags that are petroleum based using natural resources. Why are natural fibers beneficial? Natural fibers are bio-degradable, depending on the mixture amount of natural fibers and synthetic fibers (PET) will determine how long the fabric will be able to restrict the roots from penetrating the fabric once the fabric is exposed to soil on both sides. When the fabric starts degrading, the roots can then penetrate into the surrounding soil. Root Pouch offers 5 different densities and natural fiber blends to fit all types of growing. What are Root Pouch natural fiber pots made of? Root Pouch degradable plant pots are made of PET derived from recycled plastic water bottles. This material is melted back to a sterile liquid state then spun into fibers that are mixed with natural fibers which degrade over time. Because the plastic is re-melted it is once again sterile making it a great choice for growing plants for human consumption. Root Pouch does not use new petroleum as do some other fabric companies, so Root Pouch does not contain any toxins. It is BPA free and UV resistant. Post a picture of what you're growing and tag us @rootpouch on instagram with #rootpouch #rootpouch to be featured on our feed! Happy peppers going in the Root Pouches. CROWN YOUR OWN! We offer the best sustainable growing containers made from a mix of recycled water bottles and natural recycled materials. From nurseries to cannabis to urban gardening, we are the best solution for all growing needs. Share your plants with us!